The longhorned tick isn’t named for the iconic bovine symbol of the Lone Star State, but for distinctive “horns” sprouting from a portion of its head. 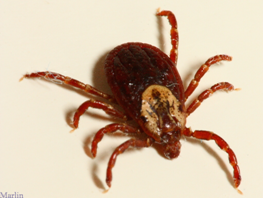 This tick is a relative newcomer to the U.S. but has been confirmed in Arkansas, and is expected here soon. It will feed on any mammal, and is a three-host tick, meaning it requires three different hosts to complete its life cycle. Animals on the menu include, but are not limited to: cattle, white-tailed deer, horses, goats, sheep, dogs, cats, opossum, birds and raccoon. They’re not sure if it feeds on people, but do know that it did in Asia and the Pacific, where it came from. Luckily, it has not been known to carry Lyme disease, but it has been known to carry several other viral and bacterial diseases. It can cause serious infestations on livestock hosts or pets and cause blood loss and stress. To top it all off, this female tick can reproduce without a male, so just one female tick can cause a serious infestation. All of the above…added to a complaint from the Farm Bureau and South Texas ranchers that the State has stopped the use of cattle spray boxes for the treatment of cattle fever ticks in South Texas, endangering the health of the South Texas cattle herd.